A color film of the Baker test is available. William Burr at 202/994-7000 or nsarchiv@gwu.edu. 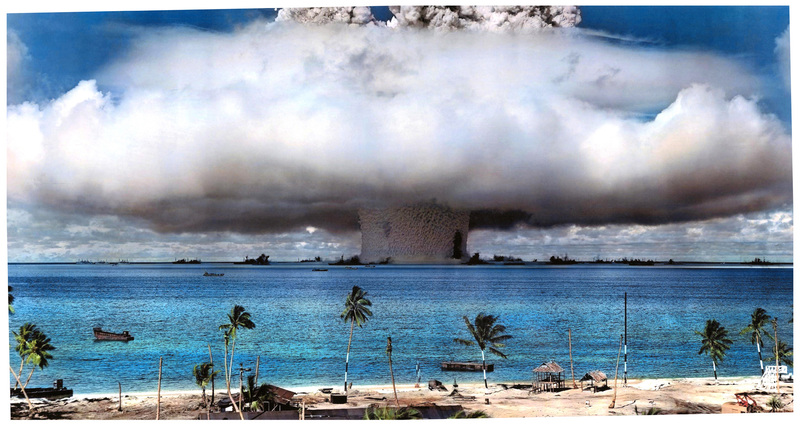 2) Project Crossroads Test Baker, Bikini Atoll, 25 July 1946 [14:46 minutes]. Using footage taken by Task Force One, the Navy’s scientific photographic unit produced separate documentaries on theCrossroads tests, which the Department of Energy later reviewed and released. Directed by Robert Stone, "Radio Bikini" was produced for PBS’s “American Experience Series” and nominated for an Academy Award in 1988 (Best Documentary Feature). A critical examination of the Crossroads tests "Radio Bikini" was organized around the perspectives of an elderly Bikinian and a U.S. serviceman who was exposed to radioactivity after the Baker test. Video 1: Joint Task Force One, “Operation Crossroads Able and Baker Day Tests, Bikini Atoll, Summer 1946”, unclassified. This 30 minute narrated film was the official Operation Crossroads documentary, prepared at the direction of Task Force One director, Admiral William Blandy. It may have been prepared for internal U.S. government use. 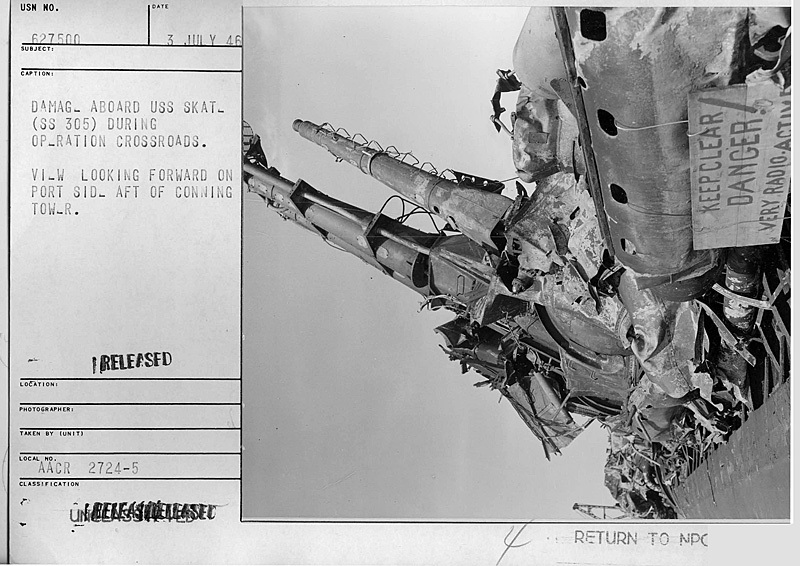 Source: U.S. National Archives, Motion Picture Branch, RG 428, Department of the Navy, 428-MN-6817 R 1-2. Video 2: U.S. Navy film footage depicting the removal of Pacific Islanders from Bikini atoll on March 6/7, 1946. Source: U.S. National Archives, Motion Picture Branch, RG 428, Department of the Navy, 428-NPC-18023. Video 3: Unedited and visually poor quality footage of the Navy’s staging of Commodore Ben Wyatt’s official request to the Bikini population to leave their atoll. The meeting took place on 10 February 1946 and the Navy restaged it on 3 March 1946. Wyatt, King Juda and the Bikinians did repeated takes of the meeting during which Wyatt asked Juda and his people to “be willing to sacrifice their island for the welfare of all men.” King Juda, shown wearing a military uniform, restated his lines of acquiescence a number of times and by the last few minutes of the scene (ending at 7:41) was plainly unhappy with the situation. 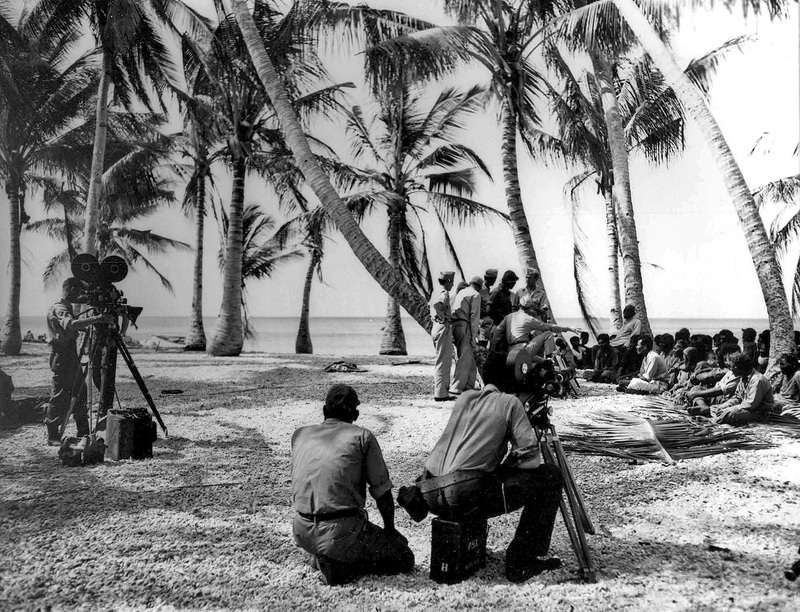 The performances concluded with the Bikinians having their last church service on the atoll and then meeting at the graveyard. Source: U.S. National Archives, Motion Picture Branch, RG 428, Department of the Navy, 428-NPC-18022. Video 4: This footage, excerpted from a longer film, depicts pre-test aerial activity and the detonation of Able as seen from the air. 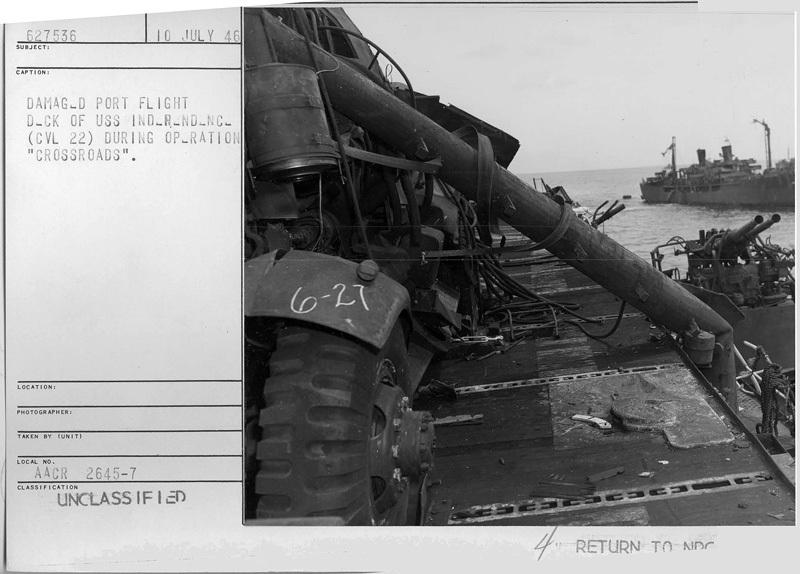 Source: U.S. National Archives, Motion Picture Branch, RG 111, Records of the Chief Signal Officer, 111-ADC-7179. Video 5: As shown by the slate at the first few seconds of this film, this footage of the Able shot was taken from a tower on Enyu island. Source: U.S. National Archives, Motion Picture Branch, RG 428, Department of the Navy, 428-NPC-18358. Video 6: This U.S. Navy film, an excerpt from a longer film, depicts the Able detonation from the perspective of sailors aboard an observation ship. Source: U.S. National Archives, Motion Picture Branch, RG 428, Department of the Navy, 428-NPC-18301. Washington, D.C., July 1, 2016 - Seventy years ago this month a joint U.S Army-Navy task force staged two atomic weapons tests at Bikini atoll in the Marshall Islands, the first atomic explosions since the bombings of Japan in August 1945. 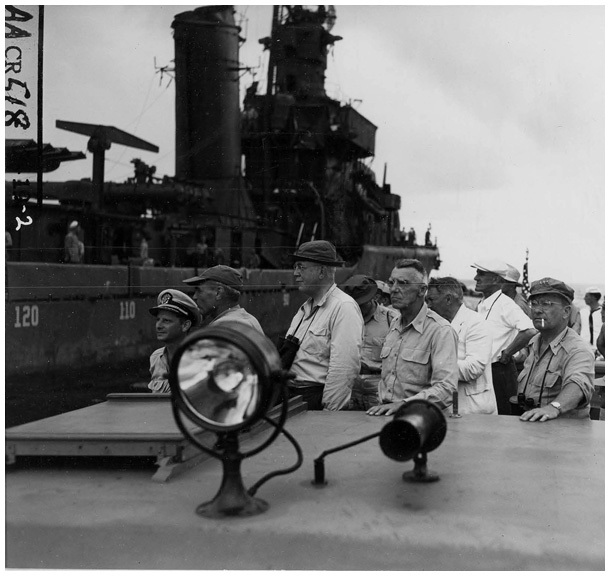 Worried about its survival in an atomic war, the Navy sought the tests in order to measure the effects of atomic explosions on warships and other military targets. The test series was named Operation Crossroads by the task force’s director, Rear Admiral William Blandy. The first test, Able, took place on 1 July 1946. Of the two tests, the second, Baker, on 25 July 1946, was the most dangerous and spectacular, producing iconic images of nuclear explosions. A third test was scheduled, but canceled. Photographs and videos posted today by the National Security Archive document Crossroads, focusing on the Able test. 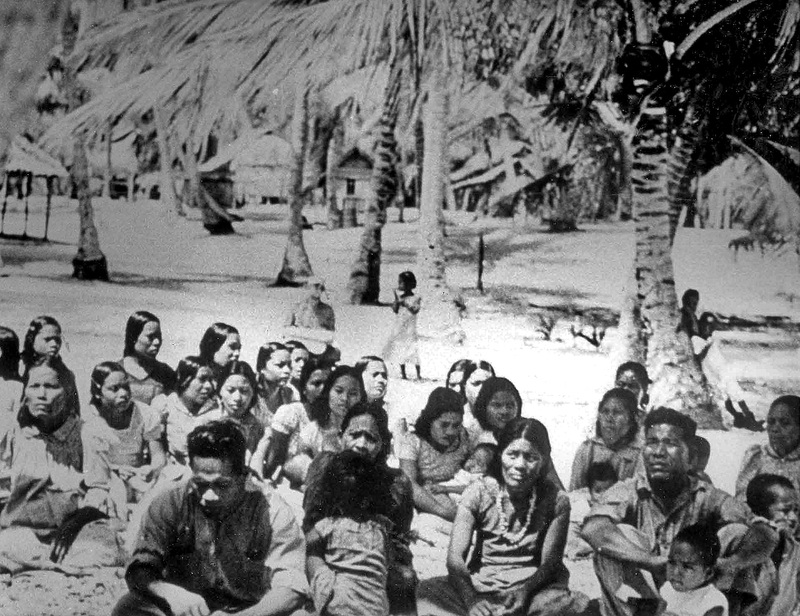 Also documented is the U.S. Navy’s removal, in early March 1946, of 167 Pacific islanders from Bikini, their ancestral home, so that the Navy and the Army could prepare for the tests. 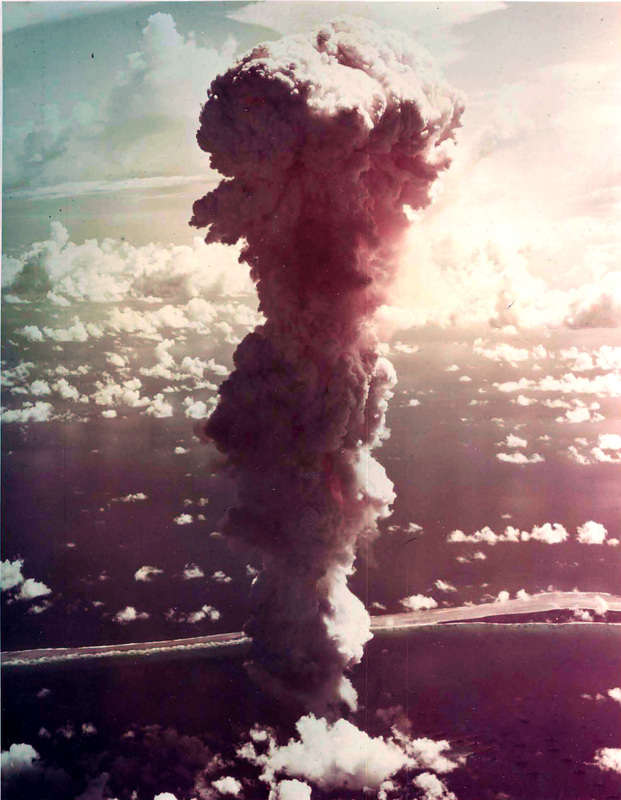 The Bikinians had the impression that the relocation would be temporary but the islands remain uninhabitable due to subsequent nuclear testing in the atoll. To stage the tests the Navy sought a remote site under U.S. control where it could assemble old and retired ships and detonate atomic weapons above or below them. By December 1945, Navy planners had decided that the most suitable location was Bikini, part of the Marshall Islands group, which had been captured from the Japanese in early 1944. The atoll’s people were descendants of communities that had lived there for thousands of years, subsisting on coconuts and seafood. So that Admiral Blandy’s task force could prepare for Crossroads, the Navy took over the atoll. 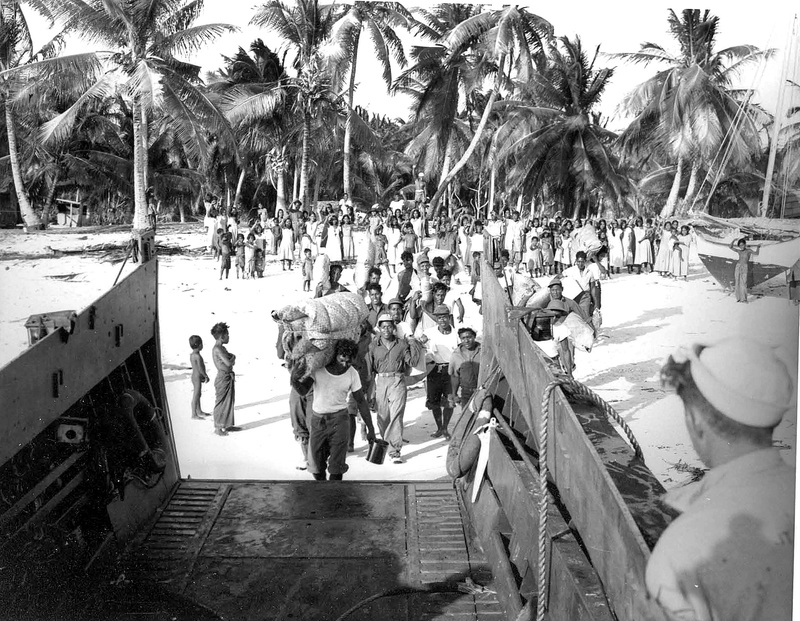 Therefore, in February 1946, Commodore Ben Wyatt, the Marshall Island’s military governor, informed the Bikinians that they must leave so that the U.S. government could conduct military tests “for the good of mankind.” On 7 March the Navy transported the Bikinians to Rongerik Island where, as it turned out, food and water were in short supply. Over 42,000 U.S. military and civilian personnel, of whom 38,000 were naval personnel, participated in preparations and activities relating to Crossroads. The task force included eight task groups with such responsibilities as communications and electronics, photography, instrumentation, safety/security, and inspection of target ships, among others. Fifteen universities were involved and so were many corporations and nongovernmental organizations. 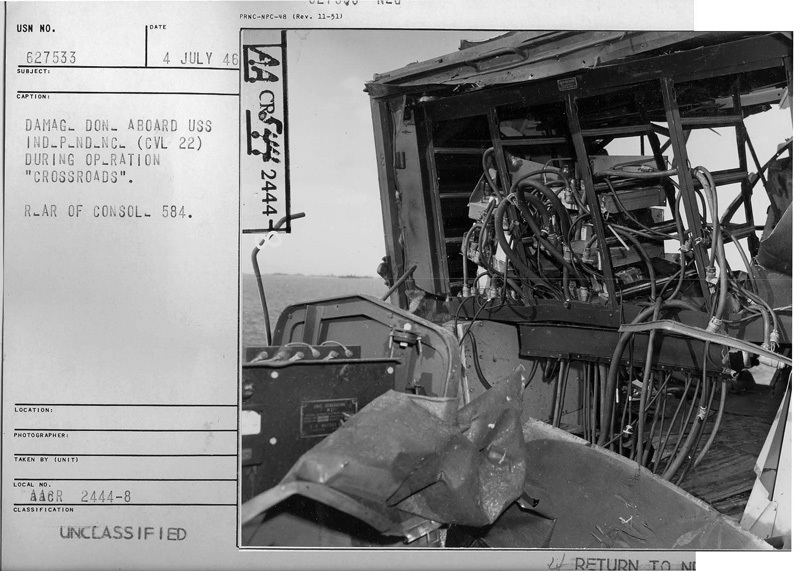 Part of the work included deploying military equipment to be exposed to the tests (the Army alone had 3,000 personnel assigned to measure damage to army equipment exposed to the explosion). The fleet of target ships included 94 aircraft carriers, battleships, cruisers, destroyers, submarines, and landing craft, among other ships. Some of the vessels had been declared excess inventory after the Navy had scaled down its forces, and others had been damaged during World War II. Three German and Japanese warships captured during the war were among the ships to be targeted. Stressing the “defensive” aspects of Crossroads, the Navy organized a massive publicity campaign but public criticism emerged, domestically and internationally, leading to an intensified public relations effort. During 1946 the Cold War had not yet emerged, but U.S.-Soviet relations were uneasy, and among the concerns expressed by U.S. critics was that a “grandiose display of atomic power” (Sen. Scott Lucas, D-Ill.) would increase international tensions. Moreover, the first test, scheduled for 15 May, would send the wrong signal when Washington was involved in United Nations discussions over international control of atomic energy. Some opponents worried about a waste of resources while plans to expose test animals to radioactivity generated protest letters, with the Society for the Prevention of Cruelty to Animals playing a leading role. Skeptical scientists argued that the tests would produce no new information and in a letter to President Truman, former Manhattan Project director J. Robert Oppenheimer argued that mathematical calculations and model tests would produce better data. In light of the conflict with the U.N. discussions, President Truman ordered the first test to be postponed until 1 July. 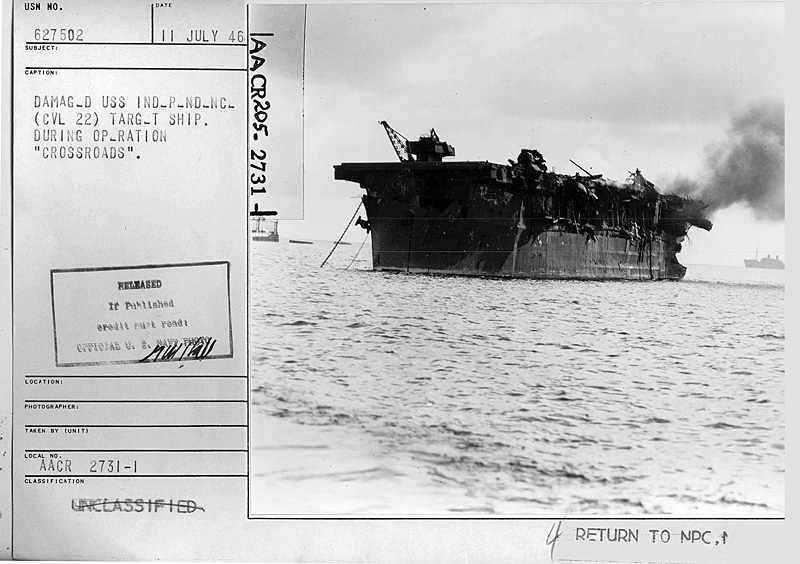 The first test, Able, which occurred on 1 July, involved an air burst directly above the assembled ships. “Dave’s Dream,” the B-29 Superfortress which carried out the Able test run, dropped a “Fat Man” plutonium bomb (the type dropped on Nagasaki), with an explosive yield of 23 kilotons. The bomb missed its target by several thousand feet, destroying inadvertently one of the ships carrying measuring instruments. The error created a storm of criticism, but it was never fully explained, although the poor ballistics of “Fat Man” were probably a factor. The blast did not destroy large numbers of target ships but five sank and some 40 others were damaged, many of them rendered useless. For understating the damage, the Navy was criticized by the media and the Army Air Force (which regarded naval forces as obsolete). Others in the media, on ships at far distances from the test, did not feel Able’s shock waves and expressed disappointment, treating it as virtually a dud. The Crossroads tests were the subject of intense media coverage with scores of journalists from the U.S. and overseas covering the Able test (somewhat fewer attended the second test). Members of Congress also attended as did a cabinet member (Secretary of the Navy James Forrestal). Ten nations on the United Nations Atomic Energy Commission, including the Soviet Union, accepted U.S. invitations and sent observers. The plans for the tests influenced newspaper and radio coverage for months before July 1946 and when the tests occurred, they dominated the front pages. Even though basic information about atomic weapons (e.g., production, design, yield, and effects) was highly classified, as was information about the results of the tests, according to the Manhattan Project’s report on Crossroads, "it has been truly said that the operation was ‘the most observed, most photographed, most talked-of scientific test ever conducted.’ Paradoxically, it may also be said that it was the most publicly advertised secret test ever conducted." The second test, Baker, on 25 July 1946, was an underwater nuclear detonation which disastrously spread radioactive fallout on nearby ships, eventually putting a halt to decontamination efforts because of the danger to naval personnel. The third test, also underwater, was subsequently cancelled, partly because the stockpile of bombs was so small. An upcoming National Security Archive posting, to be published later in July 2016, will document the Baker test and the decision to cancel the third test, providing more background material, including additional photographs, government films, and declassified reports and memoranda. * Thanks to Martha DeMarre, Nuclear Testing Archive, National Security Technologies, LLC (contractor to the United States Department of Energy) for invaluable help with sources.
. This text relies heavily upon the most comprehensive and wide-ranging account of Crossroads, Jonathan M. Weisgall’s Operation Crossroads (Annapolis, Naval Institute Press 1994). Also helpful was the chapter on Crossroads in James P. Delgano’s Nuclear Dawn: the Atomic Bomb from the Manhattan Project to the Cold War (Botley, Oxford, Osprey Publishing, 2009), 138-162.
. James B. Hershberg, James B. Conant: Harvard to Hiroshima and the Making of the Nuclear Age (Stanford, Stanford University Press, 1995), 267. Quotations by Assistant Chief of Naval Operations Admiral Robert Lee Dennison and Army Air Force commander Carl Spaatz, Melvyn P. Leffler Preponderance of Power: National Security, the Truman Administration, and the Cold War (Stanford: Stanford University Press, 1992), 116.
. Manhattan District History, Book VIII, Los Alamos Project (Y) – Volume 3, Auxiliary Activities, Chapter 8, Operation Crossroads (n.d., ca. 1946), as cited in Restricted Data: The Nuclear Secrecy Blog. King Juda (central figure on the right) and the Bikinians shown during a meeting, presumably with Commodore Ben Wyatt [undated photo]. (NARA, Still Pictures Unit, Record Group 374-G, box 7, folder 60 “Tests: Operation Crossroads”).